Auto exhibit — “Iron, Steel and the Automobile,” the 28th Annual Antique Auto Exhibit, will take place from noon to 4 p.m. at the Michigan Iron Industry Museum in Negaunee Township. Featured will be more than 50 vintage vehicles from the 1910s to 1969; live music by the Bluffs Orchestra (jazz and swing); and a food concession. A special presentation by Ford Motor Company Historian Robert Kreipke will be given at 1:30 p.m.
Dance — Cedar Creek Band will provide the music for a dance at the Trenary Community Building. The band will perform from 1-5 p.m. Admission is $5 with a lunch available for $3. All are welcome. Bridge — Swiss Teams played at 1 p.m. the third Sunday at the Superiorland Bridge Club, next to MC Sports at the Westwood Mall, Marquette. Visit http://superiorland_ bridge.tripod.com/ for more information or call Cerona at 249-3529 or Karen at 273-1716. ACA — Adult Children of Alcoholic/Dysfunctional Families beginners meeting/work book study is 6-8 p.m. at First Presbyterian Church, 120 N. Front St., Marquette. Call 361-2563. MCHD — No clinic services available today at the Marquette County Health Department. Alcoholics Anonymous — Early Bird meeting, 7-8 a.m., First United Methodist Church, Marquette. Handicapped accessible. Call AA Hotline at 249-4430. For a complete AA meetings list visit www. aa-marquettecounty.org. Beacon Light — Volunteers are needed for mail preparation of the Ishpeming High School Alumni Association newsletter, The Beacon Light. The preparation will take place at 9:30 a.m. Volunteers are asked to report to the Ishpeming High School library. Use the Division Street entrance as all others will be locked. Work will consist of labeling approximately 6,000 pieces of mail. Book Babies — 10:30-10:50 a.m. Peter White Public Library Community Room. Enjoy songs, rhymes, stories and fingerplays for ages 0-24 months and stay for a playtime afterward. Free. For more information call 226-4320, visit www.pwpl.info. Summer at Richmond Township Library — Let’s Build Together is the Summer Reading Program at the Richmond Township Library, funded in part by the Community Foundation of Marquette County. This date from 11 a.m.-noon: Let’s Start Reading. For more information visit www.uproc.lib.mi.us/rich or find the library’s Facebook page. Alcoholics Anonymous — Women’s “Twelve Steps, Twelve Traditions” discussion meeting at noon, Marquette Missionary Church. Handicapped accessible. Call AA hotline at 249-4430. Gwinn Caregivers — support group meets 1 p.m. third Mondays at the Gwinn Clubhouse (Forsyth Senior Center). For more information, call 346-9862. Mindful Mondays — 2-3 p.m. Peter White Public Library Community Room. A time for kids 6 and up to enjoy story-time and explore mindful activities like yoga, breathing exercises, crafts, and more. Join us on June 12 for a special partner yoga class with guest instructors from MoireYoga. Free. For more information, call 226-4320 or visit www.pwpl.info. Computer Coaching — Focus on a different topic each week, and learn how to become more proficient on a computer. Peter White Public Library Computer Lab. 3 p.m. 226-4312. Cadet Squadron — Lake Superior Cadet Squadron meets 6 p.m. first/third Mondays at the Munising American Legion. Open to ages 12-21. Peter White Public Library Strategic Planning — Business Reference Room, 7 p.m.
MCHD — Clinic Services available today at the Marquette County Health Department are: HIV/AIDS Counseling and Testing, and Immunizations from 8:30 a.m.-4:30 p.m. A WIC Clinic will be held from 8:30 a.m.-4 p.m.
Tai Chi — Tai Chi is offered from 10-11:45 a.m. and from 5:30-7 p.m. in downtown Marquette. Call 235-3502. Astronomy for Everyone — 10:30 a.m.-12:30 p.m. Peter White Public Library Community Room. Explore the size and scale of the universe with famed astronomer and former NASA consultant Kevin Manning. At noon, we will go outside for sunspot viewing. Ages 6+ recommended. For more information call 226-4320 or visit www.pwpl.info. 2’s & 3’s Storytime — 10:30-11 a.m. Peter White Public Library Community Room. Join for stories, fingerplays, songs and activities. Free. Ages 2 and 3. For more information call 226-4320 or visit www.pwpl.info. Carnegie summer — The Ishpeming Carnegie Public Library offers Junior Civil Engineering Program with Michigan Department of Transportation at 11 a.m. Kids ages 6-10 are invited to join Julie from MDOT as she offers an introduction to their Transportation and Civil Engineering (TRAC) program. This hands-on program is designed to integrate science, math, and social science. And Civil Engineering Program with Michigan Department of Transportation at 1 p.m. Young people ages 10-18 are invited to join Julie from MDOT as she offers an introduction to their TRAC program geared towards tweens and teens. This hands-on program is designed to integrate science, math, and social science. Yoga — Yoga is offered from noon-1:30 p.m. in downtown Marquette. Call 235-3502. Matinee Movie — “Hidden Figures,” 2016 PG, 2 hr. 7 min. Stars: Taraji P. Henson, Octavia Spencer and Janelle Monae. Historical drama. Closed captioning on for access to all. Peter White Public Library Community Room, 12:30 p.m. 226-4318. Bridge — is played at 1 p.m. at the Superiorland Bridge Club, next to MC Sports at the Westwood Mall, Marquette. Visit http://superiorland_bridge.tripod.com/ for more information or call Cerona at 249-3529 or Karen at 273-1716.. Teen Zone Chill @ the Library — 3-5 p.m. Peter White Public Library Teen Zone. Grab a snack and a friend or two, and chill out in a comfortable, air-conditioned booth at the library. Play board games, work on our community jigsaw puzzle, or browse through the teen book shelves. Lemonade and iced tea will be provided. Grades 7 to 12 welcome. Free of charge. For more info, call 226-4321 or visit www.pwpl.info. BYO Dinner Theater — “Moonlight,” 2016 R, 1 hr. 51 min. Stars: Maheshak Ali, Shariff Earp and Duan Sanderson. Oscar winning drama. Peter White Public Library Community Room, 6 p.m. 226-4318. ACA — Adult Children of Alcoholic/Dysfunctional Families Big Red Book study meeting is 6:30-7:30 p.m. at First Presbyterian Church, 120 N. Front St., Marquette. Call 273-0396. Grief Support Group — for survivors of suicide loss meets 7-8:30 p.m. third Tuesdays in the Dandelion Cottage Room at the Peter White Public Library. For details call 228-6545, ext. 10. Alcoholics Anonymous — 7 p.m. in the Gwinn Clubhouse Community Room in Gwinn. DivorceCare — meets 7 p.m. at Redeemer Lutheran Church in Marquette. Call 228-9883 or visit www.divorcecare.com. County EDC — The Board of Directors of the Economic Development Corporation of the County of Marquette will meet at 8 a.m. at the Lake Superior Community Partnership office, 501 S. Front St., Marquette. MCHD — Clinic Services available today at the Marquette County Health Department are: HIV/AIDS Counseling and Testing, Family Planning, Breast and Cervical Cancer Screening, STD, and Health Services from 8:30 a.m.-4 p.m. A WIC Clinic will be held from 8:30 a.m.-4 p.m.
Ely assessor — The Ely Township Assessor will have hours from 10 a.m. to 4 p.m. at the Ely Township Hall. Alcoholics Anonymous — women’s closed Big Book meeting, noon at Marquette Missionary Church. Handicapped accessible. Call AA hotline 249-4430. Peter White Public Library Summer GLOW Club — 1-2:30 p.m. Peter White Public Teen Zone. Join a fun social club for LGBTQ individuals and their allies. Bring own snacks, hang out with friends, and make some new ones. Grades 7 to 12 welcome. Free of charge. For information, call 226-4321 or 226-4323 or visit www.pwpl.info. Carnegie summer — The Ishpeming Carnegie Public Library offers STEAM: Wreck This Journal at 2 p.m. Design and create a collaborative journal with wacky and creative prompts to keep. Ages 10 and up. Bergonzi String Quartet — The Secret Language of Music, Children’s Concert, 2-3 p.m. Peter White Public Library Community Room. This free concert will take you on a journey through time and space. All ages can come join the excitement. Free. For more information, call 226-4320, visit www.pwpl.info. Historical — The Champion-Beacon-Humboldt Historical Society will meet at 2 p.m. at the Champion Township office, located along U.S. 41 in Champion. Everyone is invited to attend. Summertime Scribblers Creative Writing Club — Peter White Public Library Teen Zone. Everyone in grades 6 to 12 is invited to decorate the cover of a composition book to create their own personal summer journal. Then we’ll meet each Wednesday to fill in the pages with great writing. Materials will be provided, thanks to funding from Dr. Allyn Roberts in memory of Forest Roberts. 3-4:30 p.m. Free. For more information, call 226-4321 or visit www.pwpl.info. Farmer’s Market — 4-7 p.m., Miners Park, Negaunee. Email market@cityofnegaunee.com for more information. Grief Support — Open grief support group meets 5:30-7 p.m. first/third Wednesdays at Lake Superior Hospice in Marquette. For details call Michele Napier at 225-7760. Bike Path — The Marquette Regional History Center presents: The Amazing Bike Path Tour 2.0 at 6 p.m. Participants should meet at MRHC for a group bike ride with Jim Koski around Marquette’s bike path system, starting and ending at the History Center with more than a dozen stops, visiting everything from old lumber mills and railroad yards, to a one-time city dump. The suggested donation is $5. Visit marquettehistory.org or call 906-226-3571 for more info. Ely Township Board — meets at 6 p.m. at the Ely Township Hall. Bariatric Support Group — meets 6-7 p.m. third Wednesdays, Arcadia Health Care, Marquette. Call 800-440-7862. ACA — Adult Children of Alcoholic/Dysfunctional Families Big Red Book study meeting is 6-7 p.m. at the Alano Club, 1202 S. Front St., Marquette. Call 273-0396. Music in the Park — The Erickson Center for the Arts in Curtis will be from 6:30-8:30 p.m. in the band shelter in the ECA Park. Negaunee Beautification Committee — will meet at the Pocket Park on Iron Street at 6:30 p.m. The items for the Iron Ore carts will be ready for pickup. A workbee in the park will be held prior to a meeting at the Midtown Bakery and Cafe. Everyone is welcome and no experience is needed. For further information contact Anna Mattson at 475-5058. Marquette Genealogical Society — meets at 6:45 p.m. in the Peter White Public Library Shiras room. There will be trivia and new members are welcome. Sci-Fi on Tap — “Brave New World” by Aldous Huxley. This new science fiction book club will focus on utopias this summer, starting with the 1932 classic in which Huxley explores how genetic breeding, social indoctrination and pharmaceuticals can create a utopian society. Ore Dock Brewing Co., 7 p.m. 226-4323. Grief Support Group — meets 7 p.m. third Wednesdays at the St. Joseph Activity Center in Ishpeming. Meetings are open to anyone grieving the loss of a loved one. Free yoga — Rohana Yoga & Wellness is offering a free yoga flow on the boardwalk along the shore of Lake Superior in celebration of the third annual International Day of Yoga. The Rohana Yoga & Wellness studio located in the beautiful Rosewood building in downtown Marquette, will be hosting this free community event at 7 p.m. For more information, visit Rohana Yoga & Wellness’s events on Facebook, email be.rohanayoga@gmail.com or call 906-273-0383. The Negaunee City Band — under the direction of Sara Perfetti plays at 7:30 p.m. at the Outdoor Performing Arts Center at the east end of Iron Street. Some seating is available, but attendees may wish to bring their own chairs. Eagles Aerie — Auxiliary, Negaunee Eagles Aerie 1944 meets at 7:30 p.m. first/third Wednesdays at the club. Superiorland Breakfast Kiwanis — meets 7-8 a.m., Pioneer Room A of University Center at Northern Michigan University. Meetings are open to the public. MCHD — A WIC Clinic will be held from 8:30 a.m.-4 p.m. at the Marquette County Health Department. UPAWS rummage — The Upper Peninsula Animal Welfare Shelter’s rummage sale takes place from 9 a.m. to 4 p.m. at 843 W. Washington St., Marquette. For more information, visit website: www.upaws.org. Open Gym — from 10:30-noon at PEAK Gymnastics and Fitness, Marquette. $5 entry fee. Non-members are welcome. The Men’s Lunch Group — meets at 11 a.m. fourth Thursdays at Hong Kong Buffet, Marquette. For details call Phil Puotinen at 228-3910. Elba Morse Group — will meet at 11:30 a.m. at Jeffery’s Restaurant in Marquette. All area retired nurses and their guests are invited and no reservations are necessary. Marquette Beautification and Restoration Committee — meets at noon at the Landmark Inn. Mona Lang, executive director of the Downtown Development Authority, will present “How Marquette Leverages Its History to Become a Model of Place Making.” A lunch is available at a cost. For more information, visit mqtbeautification.org. Carnegie summer — The Ishpeming Carnegie Public Library offers Teen Book Challenge at 1 p.m. Ages 14 and up are invited to come to hear about great teen books with a theme of empathy; then take the challenge. Then M.L. Liebler, authoer, will visit along with special guests the Rev. Robert Jones and Carole Hoste at 5 p.m. Charlie Palazzola, the Rev. Robert Jones, and Carole Hoste will provide live music for the event. Copies of the award-winning books will be made available for purchase and a chance to meet Liebler and the musicians will follow the event. A Kindle will be given away to one lucky audience member. All ages welcome. Story & Craft Hour, Ages 4-6 — 1-2 p.m. Peter White Public Library Community Room. Enjoy stories, songs, and crafts. Free. For more information, call 226-4320 or visit www.pwpl.info. Peter White Public Library Teen Thursday — Get Surreal, 2-4 p.m. Marquette Arts and Culture Center Workshop 3, on the library’s lower level. Create a wildly surreal collage on plywood with guidance from high school art teacher/artist Joy Bender-Hadley. Students in fifth grade and up are invited. Free of charge. For more information, call 226-4321, 226-4323, or visit www.pwpl.info. Harry Potter Fan Club Grades 2-5 — 4:30-5:30 p.m. Peter White Public Library Community Room. All Muggles in grades 2 through 5 are invited to come talk about the wonderful wizarding world of Harry Potter-This month join in for a special Potions Class. Free of charge. Open to the public. For more information call 226-4323, visit www.pwpl.info. TOPS — Group 1579 meets at Christ the King Lutheran Church, 440 Stoneville Road, Ishpeming. Weigh-in at 5 p.m., meeting at 5:30 p.m.
Sociable Seniors — meets at 5 p.m. at Hardee’s Restaurant, Marquette. Call 360-9450. TOPS — Group 1372 meets at Silver Creek Church, 219 Silver Creek Road, Harvey. Weigh-in 5:30-6:10 p.m., meeting at 6:15 p.m. Call 226-7930. Zumba Class — meets 5:30-6:30 p.m. at Harvey Baptist Church. Cost is $3 per session, with proceeds going to missions around the world. Call 249-1013 and leave a message. Dog Nights — 6-7:30 p.m. Peter White Public Library Children’s Room. All children are invited to come and read to a dog. Increase your reading skills and confidence by reading aloud to a friendly, calm dog. Free, no registration required. For more information call 226-4320 or visit www.pwpl.info. YMCA Tang Soo Do Karate — in Negaunee for beginner youth from 6-6:45 p.m.; and intermediate all ages from 6:45-7:30 p.m. Taught by Black Belt Brad Seppala. A Christian perspective, Spirit Warrior Karate Academy. Call 360-0479 or the West End Y at 475-9666. Da Upper Yoopers Barbershop — meets at 6 p.m. at First United Methodist Church at 111 E. Ridge Street, Marquette. People of all ages, all genders, all abilities, all races are welcome to visit and support the chapter, which is a mixed-gender chorus. Concert — The 2017 L’Anse Lakefront Concert Program features the music of the Derrell Syria Project. This free concert is at 7 p.m. in Lakefront Park at the foot of Broad Street. Those attending should bring a lawnchair or blanket. Meadowbrook Arena is the inclement weather alternate site. Folk Concert — Rachael Kilgouri and Sara Pajunen bridge their distinct yet complimentary musical histories within traditional and original songs. 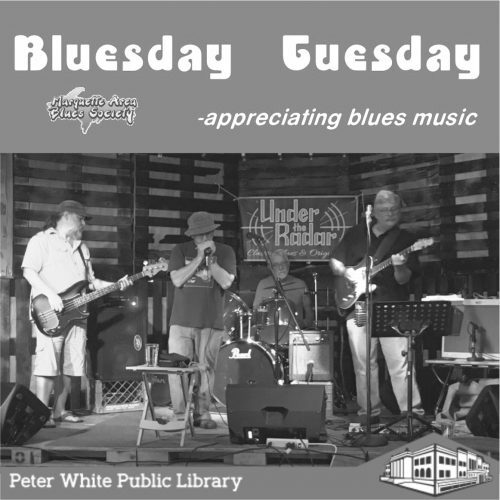 Peter White Public Library Community Room, 7 p.m. 226-4318. Cuong Nhu — class offered 7-9 p.m., Northern Lights Martial Arts Center, Marquette. Call 361-5282.